Over the last year, many industry analysts have tried to define Big Data. Some of the common dimensions that have been used to define Big Data are the 3 V’s, Volume, Velocity and Variety. (Volume = multiple terabytes or over a petabyte; variety = numbers, audio, video, text, streams, weblogs, social media etc. ; velocity = the speed with which it is collected). Although the 3 V’s do a good job as parameters for Big Data there are other things at play that need to be captured to understand the true nature of Big Data. In short, to describe the data landscape more holistically, we need to step beyond the 3 V’s. While the 3V’s are better classified as the salient features of the data, the real drivers of the Big Data are technology, economics and the tangible value that can be extracted from the data, in other words the business insights! 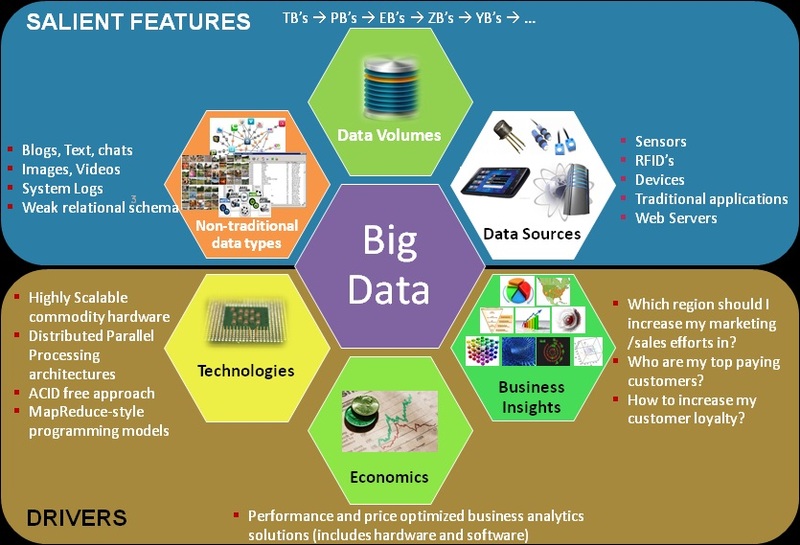 Here I want to take a closer look at some of the drivers of Big Data. Big Data analysis requires processing huge volumes of data sets that are non-relational with a weak schema, at an extremely fast pace. This need sparked a sudden emergence of technologies like Hadoop that help to pre-process unstructured data on the fly and perform quick exploratory analytics. This model breaks away from the traditional approach of using procedural code and state management to manage transactions. Other changes are happening on the infrastructure side of things. High performance and highly scalable architectures have been emerging. They include parallel processing, high-speed networking and fast I/O storage, which further help to process large volumes of data at a higher MB/s rate. In addition to the technological changes we are also witnessing a fundamental paradigm shift in the way DBA’s and data architects are analyzing data. For example, instead of enforcing ACID (atomicity, consistency, isolation, durability) compliance across all database transactions we are seeing a more flexible approach on using ACID in terms of enforcing it whenever necessary and eventually designing a consistent system in a more iterative fashion. The emergence of these new technologies is further fueled by the economics associated with providing highly scalable business analytics solutions at a low cost. Hadoop comes to mind as the prime example. I found a valuable white paper that describes how to build a three node Hadoop solution using a Dell OptiPlex desktop PC running Linux as a master machine (http://www.usenix.org/publications/login/2010-02/openpdfs/leidner.pdf). The solution was priced at <$5000. These kinds of economics are driving a faster adoption of new technologies using off the shelf hardware. Thus enabling even a research scientist or a college student to easily re-purpose his hardware for trying out new software frameworks. Large-scale clickstream analytics: many ecommerce websites use clickstream analytics to correlate customer demographic information with their buying behavior. The takeaway here is that enterprises should remain focused on the value their data can provide in terms of enabling them to make intelligent business decisions. So it important to have this holistic view that does not emphasize certain parameters related to Big Data to the detriment of others. In other words businesses have to keep in the mind the big picture. So how do you measure the impact of a Big Data implementation for your organization? I thought I’d have to read a book for a dscivorey like this!